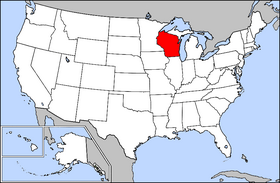 Wisconsin is a state in the United States, located in the Midwest. Although the exact etymology of the name is uncertain, "Wisconsin" is thought to be an English version of a French adaptation of an Indian word. The Ojibwe word Miskasinsin, meaning "Red-stone place," was probably the name given to the Wisconsin River, which then was recorded as Ouisconsin by the French, and changed to its current form by the English. Other theories are that the name comes from words meaning "Gathering of the Waters" or "Great Rock." Wisconsin originally was applied to the Wisconsin River, and later to the area as a whole when Wisconsin became a territory. The state's name is abbreviated WI, Wis, or Wisc. USS Wisconsin was named in honor of this state. The state is bordered by the Montreal River, Lake Superior and Michigan to the north, by Lake Michigan to the east, by Illinois to the south, and by Iowa and Minnesota to the west. Part of the state's boundaries includes the Mississippi River and St. Croix River in the west, and the Menominee River in the northeast. With its location between the Great Lakes and the Mississippi River, Wisconsin is home to a wide variety of geographical features. These features allow the state to be broken into five distinct regions. In the north, the Lake Superior Lowland occupies a belt of land along Lake Superior. Just to the south, the Northern Highland includes the state's highest point, Timms Hill, as well as massive forests and thousands of small glacial lakes. In the middle of the state, the Central Plain possesses some unique sandstone formations like the Dells of the Wisconsin River in addition to rich farmland. The Eastern Ridges and Lowlands region in the southeast is home to many of Wisconsin's largest cities. In the southwest, the Western Upland is a rugged landscape with a mix of forest and farmland. The varied landscape of Wisconsin makes the state a vacation destination popular for outdoor recreation. Winter events include skiing, ice fishing and snowmobile derbies. The distinctive Door Peninsula, which extends off of the eastern coast of the state, contains one of the state's most beautiful tourist destinations, Door County. The area draws thousands of visitors yearly to its quaint villages, seasonal cherry picking, and ever-popular fish boils. Wisconsin's self-promotion as "America's Dairyland" sometimes leads to a mistaken impression that it is an exclusively rural state. In fact Wisconsin contains cities and towns of all sizes. Milwaukee is a city slightly larger than Boston and part of a largely developed string of cities that stretches down the western edge of Lake Michigan into greater Chicago and also into northwestern Indiana. This string of cities along the western edge of Lake Michigan is generally considered to be an example of a megalopolis. Madison's triple identity as state capital, university town, and working city give it a cultural richness unusual in a city its size. Medium-sized cities dot the state and anchor a network of working farms surrounding them. In 1634, Frenchman Jean Nicolet became Wisconsin's first European explorer, landing at Red Banks, near modern day Green Bay in search of a passage to the Orient. The French controlled the area until 1763, when it was ceded to the British. After the American Revolutionary War, Wisconsin was a part of the U.S. Northwest Territory. It was then governed as part of Indiana Territory, Illinois Territory, and Michigan Territory. 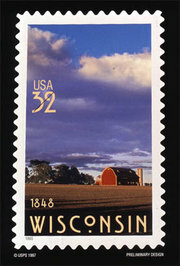 Wisconsin Territory was organized on July 3, 1836 and became the 30th state on May 29, 1848. Wisconsin's political history encompasses, on the one hand, Fighting Bob La Follette and the Progressive movement; and on the other, Joe McCarthy, the controversial anti-Communist censured by the Senate during the 1950s. The first Socialist mayor of a large city in the United States was Emil Seidel, elected mayor of Milwaukee in 1910; another Socialist, Daniel Hoan, was mayor of Milwaukee from 1916 to 1940. During both the 2000 and 2004 presidential elections, Wisconsin was considered a "swing" state due to its residents being relatively equally split between voting for the Democratic and Republican candidates. The state just barely (by about 5,700 votes) went for the Democratic presidential candidate Al Gore in 2000, and by 14,000 votes to Democratic presidential candidate John Kerry in 2004, both of whom lost the national election. The state mineral is Galena, otherwise known as lead sulfide, which reflects Wisconsin's early mining history. Many town names such as Mineral Point recall a period in the 1820s, 1830s, and 1840s when Wisconsin was an important mining state. When Indian treaties opened up southwest Wisconsin to settlement, thousands of miners—many of them immigrants from Cornwall, England—flocked to southern Wisconsin in what could almost be termed a "lead rush." At one point Wisconsin produced more than half of the nation's lead. During the boom it appeared that southwest Wisconsin might become the population center of the state, and Belmont was briefly the state capital. By the 1840s the easily-accessible deposits were worked out, and experienced miners were drawn out of Wisconsin by the California Gold Rush. This period of mining before and during the early years of statehood directly led to the development of state's nickname, "the Badger State." Many miners and their families lived in the mines in which they worked until adequate above-ground shelters were built and were thus compared to Badgers. Known as "America's Dairyland," Wisconsin is also known for cheese. Citizens of Wisconsin are referred to as Wisconsinites, although a common nickname (sometimes used pejoratively) among non-residents is "Cheeseheads," due to the prevalence and quality of cheesemaking in the state. Another nickname is "Badgers," after the state's nickname and school mascot of the University of Wisconsin. The Milwaukee Art Museum in Milwaukee is known for its unique architecture. The Milwaukee County Zoological Gardens cover over 200 acres (800,000 m²) of land on the far west side of the city. Madison is home to the Vilas Zoo which is free for all visitors, and the Olbrich Gardens conservatory, as well as the hub of cultural activity at the University of Wisconsin. It is also known for Monona Terrace, a convention center that was designed by Frank Lloyd Wright. The capital is Madison and the largest city is Milwaukee. Beginning with the governorship of Robert M. La Follette, Sr. in the early 1900s and the state Progressive Party establishment soon thereafter, Wisconsin and in particular, Madison, have often been seen as leaders in labor, and social welfare legislation as well as legislation popularly termed "socially progressive." For example, in 1982 sexual orientation was added by the state legislature as a protected category under existing anti-discrimination laws, a step in the context of the 1980s seen as highly innovative. Russ Feingold was the only senator to vote against the Patriot Act and Tammy Baldwin is the only openly lesbian U.S. Representative. The state has supported Democrats in the last five presidential contests. In 2004, John Kerry narrowly won the state's 10 electoral votes by a margin of 0.4 percentage points and 49.7% of the vote. Republicans are concentrated in the eastern and north-central parts of the state, especially in the suburban counties around Milwaukee. According to the U.S. Census Bureau, as of 2004, Wisconsin's population was 5,509,026. There are 229,800 foreign-born residents in the state (4.2% of the state population), and an estimated 41,000 illegal aliens living in the state, accounting for 18% of the foreign-born. People of German ancestry are the largest ancestry group most of the state, with about half of the state's white population reporting at least partial German ancestry on the Census, and Wisconsin is widely regarded as the most "German-American" state in the Union (although North Dakota, with 43.9% German ancestry, can make this claim). People of Scandinavian descent, especially Norwegians, are heavily concentrated in some western parts of the state. Wisconsin also has the highest percentage of residents of Polish ancestry of any state. Menominee county is the only county in the eastern United States with an American Indian majority. 33% of Wisconsin's Asian population is Hmong, with significant communities in Milwaukee, Wausau, Green Bay, Sheboygan, Appleton, La Crosse, Madison, and Eau Claire. 6.4% of Wisconsin's population were reported as under 5, 25.5% under 18, and 13.1% were 65 or older. Females made up approximately 50.6% of the population. In addition to cheese, Wisconsin is known for its beer, bratwursts, cranberries and many festivals, such as Summerfest and the EAA Oshkosh Airshow. Wisconsin is also the largest producer by volume of ginseng, cranberries, and paper products in the United States. The once coveted title of top milk producer no longer belongs to Wisconsin; the position of top milk producer is now held by California. The University of Wisconsin is an international leader in stem-cell research. Cities and villages are incorporated urban areas in Wisconsin. Towns are unincorporated minor civil divisions of counties. Milwaukee, pop. 596,125 (1,709,926 in metropolitan area), nations 33rd largest television market. Green Bay, pop. 102,263 (226,778 in metropolitan area), nations 69th largest televison market, home of Green Bay Packers football team; other area attractions include the National Railroad Museum and the Neville Public Museum. Kenosha, pop. 93,798; considered part of the greater "Chicagoland" area; site of Kenosha Velodrome, opened in 1927, oldest operating velodrome in the U. S.; International HQ of the Barbershop Harmony Society. Racine, pop. 81,703, headquarters of S. C. Johnson (Johnson Wax) with Frank Lloyd Wright-designed administration building. Once home of the Racine Belles, an All-American Girls Professional Baseball League team. Oshkosh, pop. 63,515 (372,110 in metropolitan area). Home of the busiest airport in the world—during the week when the Experimental Aircraft Association, devoted to hobbyist-built aircraft, holds its annual Oshkosh Airshow. Eau Claire, pop. 61,702. Home of National Presto and Menards. Janesville, pop. 60,294. Home to a major General Motors assembly plant, 3.5 million square feet (325,000 m²) in size. West Allis, pop. 60,254. Home of the Pettit National Ice Center (formerly the West Allis Olympic Ice Rink), training center for the U. S. Olympic speedskating team, and the West Allis Speedskating Club, which as of 2005 has nurtured 17 Olympians and 95 national champions. La Crosse, pop. 51,907. Wisconsin's main port on the Mississippi River and home of Trane. Fond du Lac, pop. 42,203 (57,479 in metropolitan area). Nearly equidistant from Green Bay, Madison, and Milwaukee. Wausau, pop. 38,469 (157,969 in metropolitan area). Home to Granite Peak Ski Area; located at crossroads of Interstate 39 and State Highway 29. De Pere pop. 20,559 home of St. Norbert College. West De Pere is not a seperate municipality; but, rather the neighborhoods of De Pere west of the Fox River. Wisconsin Dells, pop. 2,418 (approx. 4,000 including Lake Delton), popular resort area, home of Tommy Bartlett's thrill shows and numerous hotels and themeparks.